The University of Nigeria, Nsukka (UNN) has held its 119th Inaugural Lecture, with the lecturer, Prof Nnanyelugo Okoro, of the Mass Communication Department, explaining how the nation can harness image branding to drive growth. JAMES OJO (400-Level Mass Communication) and GIDEON ARINZE (300-Level Mass Communication) report. How can Nigeria rebrand to improve its image in the 21st century? This question was answered at the 119th Inaugural Lecture of the University of Nigeria, Nsukka (UNN) in Enugu State. It held at the Princess Alexandra Auditorium (PAA). Speaking on the theme: Positioning Nigeria as a brand for global competitiveness in the 21st Century: Roadmap to best practice, before a group of scholars and policymakers, a lecturer, Prof Nnanyelugo Okoro of the Department of Mass Communication, pointed out that there was urgent need for the country to brand itself and assume a new image that could fast-track its development. He said: “Today, no nation can go it alone and as things stand, an unbranded nation cannot take its pride of place in the comity of nations. If these facts are admitted, then it becomes imperative that Nigeria engages in comprehensive branding efforts to extricate itself from the tentacles of bad reputation it finds itself in. While stressing the need for image branding, the speaker, who is the first professor of the department, said the imperative for nation branding was in response to realities in the global order, noting that a country’s image and reputation are not only germane to attaining success in the global marketplace, but that they are also key factors for gaining a competitive edge in global engagements. Every nation, he said, is endowed in history, geography, culture and people, adding that countries’ peculiarities are valuable assets that must be converted to positive image and reputation to earn foreign exchange. 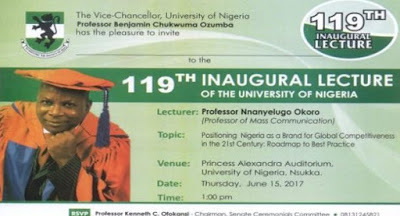 The lecturer regretted that there was no “comprehensive and professional” attempt to position Nigeria as a good brand in its 103 years of existence as a geographical entity and 57 years an independent nation. Okoro urged the Federal Government to “urgently” create the Ministry of National Branding and Public Diplomacy to address the country’s image and reputation problems. The Vice-Chancellor (VC), Prof Benjamin Ozumba, hailed the inaugural lecturer, describing him as a “thorough-bred communicator and public relations professional”. He said the theme of the lecture was aimed at educating the public on the linkage between branding and development. The VC, represented by his deputy for Academics, Prof James Ogbonna, reiterated his administration’s commitment to using research to position the institution as pace-setter of knowledge among its peers.